The above quote, attributed to the Lebanese-American author Khalil Gibran (1883-1931), most well known for his book The Prophet, has always been one of my favorites. Serving as a counterpoint to a prevailing cultural ethos that too readily equates strength with acts of self-empowerment and self-aggrandizement, it is a reminder of a "quieter" strength, one that doesn't seek the world's attention and approval, but instead manifests itself in acts of humility, sacrifice and loving kindness when no one is looking. While I did not know her, and was made aware of her only recently through a friend, I get the sense that Colleen Ritzer - a Massachusetts native and high school math teacher whose life was tragically and mercilessly stolen from her at the age of 24 - was one of these people. Described in this Boston Globe article as "a paragon of caring" who was "lighthearted, kind, and genuinely nice" and in this CNN article as a "dynamic and brilliant ray of light", a "young caring girl" who was "energetic and compassionate" and "extremely approachable", and again in this Huffington Post piece as a "very, very respected, loved teacher" and "gentle, with a big smile," the impact Colleen has had on her friends, family, students and strangers is certainly palpable. "I really do believe the reason why so many have connected to Colleen since her passing is because she was simply good to people in an effortless way," says Jennifer Berger, a close friend of Colleen's since kindergarten. "For example, she'd always greet you with a big smile, or let you know she was thinking about you by sending a card when there was no occasion." She added: "Colleen was a genuine person who cared about people and was always thinking of others...she valued her family and friends to the utmost [and] was an amazing role model." On October 22nd, marking the two-year anniversary of Colleen's death, Ms. Berger is organizing a "Kindness Campaign", asking people to perform acts of kindness and share them online using the hashtag #Kindness4Colleen, to help honor her legacy and the values by which she lived. "The goal of the #Kindness4Colleen campaign is to turn the day that will always be sad, the day we lost Colleen, and try to make it a little better," she says. "I have always wanted to find a way to honor Colleen's legacy and I couldn't think of anything better than asking people to spread kindness in her name." While there are certainly many different ways of exhibiting kindness - from smiling at a stranger to helping an elderly person cross the street - Ms. Berger says that, to her, being kind is thinking beyond yourself and being considerate of others. "Kindness can be big or small and sometimes it's the little things that can have the greatest impact," she says. "From a really young age, Colleen and I learned to treat others as you would like to be treated," she continued. "Colleen was the epitome of that and more." In fact, a favorite quote of Colleen's, attributed to Taylor Swift, comes from her teacher twitter account, which she regularly used to connect with her students, posting homework assignments along with inspirational messages: "No matter what happens in life, be good to people. Being good to people is a wonderful legacy to leave behind." That Colleen practiced such goodness in her own life, thereby creating a lasting impression and "wonderful legacy", is evident in the campaign that Ms. Berger is organizing - and serves as further proof that kindness carries with it a quiet strength and power that can trump all else. After all, as Maya Angelou once said, "At the end of the day, people won't remember what you said or did. They will remember how you made them feel." 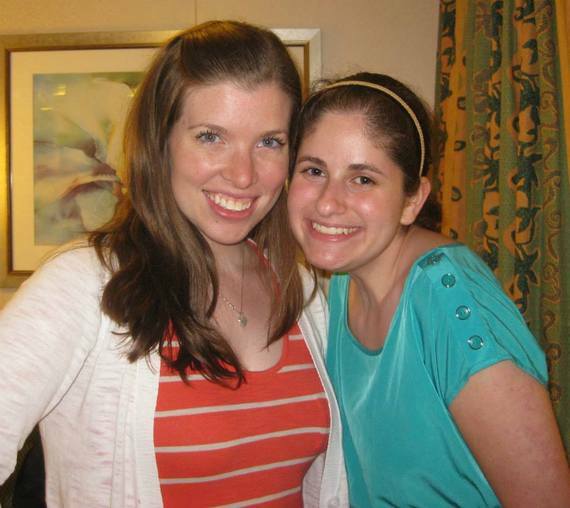 You can read more about Colleen's legacy and the #Kindness4Colleen campaign on the Colleen E. Ritzer Memorial Scholarship Fund's website. This post originally appeared on Katharine's blog, All Things Good. Follow All Things Good on Facebook and Twitter.